SYNOPSIS It’s January 1969. Richard Nixon has been inaugurated as the 37th president of the United States. A new decade beckons. And seven very different but equally lost souls converge on the El Royale, a once-glorious resort that has since fallen—like its visitors—into disrepute. Situated on the border between California and Nevada, the El Royale offers warmth and sunshine to the west; hope and opportunity to the east. It also straddles the colliding worlds of past and present. Once the hotspot of Tahoe, where the country’s most famous celebrities and politicians comingled in and around the resort’s casino, bar, bungalows and pool, the good times have now come to a close. As is the El Royale. Now, in the resort’s lobby where the shine has faded and the laughter fallen silent, gather Father Daniel Flynn (Jeff Bridges), soul singer Darlene Sweet (Cynthia Erivo), traveling salesman Laramie Seymour Sullivan (Jon Hamm), hippie Emily Summerspring (Dakota Johnson), her sister Rose (Cailee Spaeny), manager Miles Miller (Lewis Pullman) and the enigmatic Billy Lee (Chris Hemsworth). Over the course of one fateful night, everyone will have the last shot at redemption… before everything goes to hell. Twentieth Century Fox presents Bad Times at the El Royale, written and directed by Drew Goddard (The Cabin in the Woods) and starring Academy Award®-winner Jeff Bridges (Crazy Heart), Tony® Award-winner Cynthia Erivo (Broadway’s The Color Purple), Dakota Johnson (Fifty Shades trilogy), Emmy® Award-winner Jon Hamm (Mad Men), Cailee Spaeny (Pacific Rim: Uprising), Lewis Pullman (Battle of the Sexes), and Chris Hemsworth (Avengers: Infinity War). The behind-the-scenes talent includes Academy Award®-nominated director of photography Seamus McGarvey (The Greatest Showman), production designer Martin Whist (Night at the Museum: Secret of the Tomb), editor Lisa Lassek (The Avengers), Academy Award®-nominated costume designer Danny Glicker (Milk), and Academy Award®-winning music composer Michael Giacchino (Up). 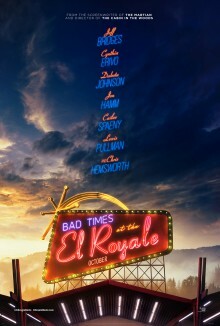 Bad Times at the El Royale is produced by Jeremy Latcham (Spider-Man: Homecoming) and Goddard, and is executive produced by Mary McLaglen (War for the Planet of the Apes). Join LatinoScoop at an exclusive advance screening of BAD TIMES AT THE EL ROYALE in select locations below. Click on the city name below for your city and enter the code. If you download a screening pass and aren’t able to use it, please share it with someone who can attend. There is a limited number of passes available for each location. Screening passes are available on a first-come, first-serve basis. Additional passes will not be added once they are all redeemed. Anyone downloading a screening pass is advised to arrive early to secure seating. The theater is intentionally overbooked by the studio to ensure a full house. Plan accordingly to arrive with enough time.